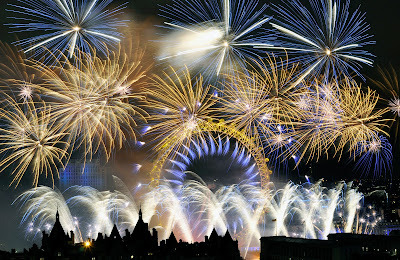 The official blog site for Kimbolton Fireworks Limited. Firework Manufacturers, Importers and Retailers. 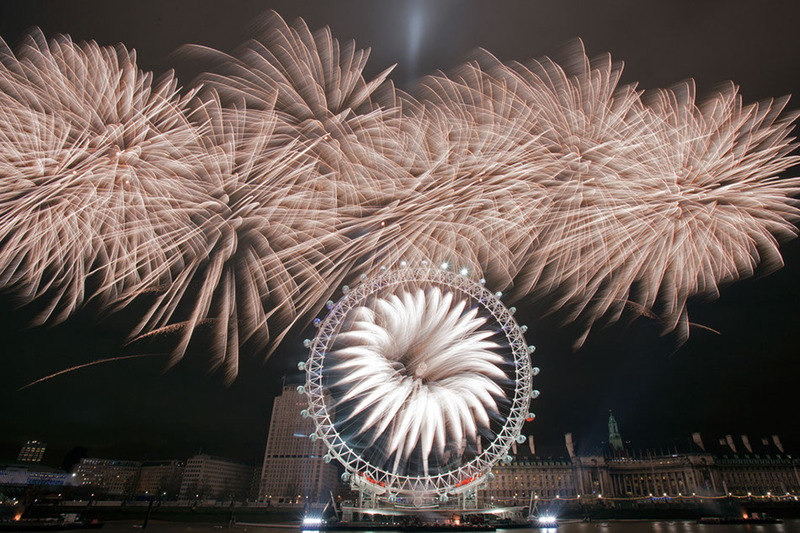 We started 2012 in spectacular style with an amazing display fired from the Great Clock Tower, the London Eye and barges on the Thames for the Mayor of London's New Year's Eve celebrations, as well as Edinburgh's Hogmanay, this kick started an amazing year for Kimbolton Fireworks which has kept our display teams very busy. The Olympic year was always going to be a frenetic year, with the procurement process of the London 2012 Olympic and Paralympic games behind us, the planning started as soon as we returned from our New Year's Eve exploits with the prospect of delivering four world class ceremonies that would be watched by over 1 billion people world wide. The busy summer program started with the opening of the 2012 Festival in late June with a firework finale at the Big Concert, on midsummer night Gustavo Dudamel and the Simon Boliver Symphony Orchestra of Venezuela performed a spectacular outdoor concert set against the stunning back drop of Stirling Castle. Very quickly the 27th July loomed ever closer and our team of 50 pyrotechnicians worked tirelessly around the clock to rig and set up the largest display the country has ever witnessed. 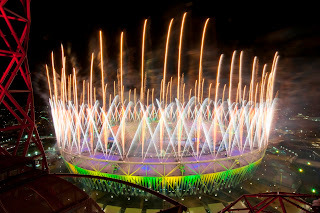 The Opening Ceremony of the Olympic Games was a once in a life time opportunity and it was an honour and a privilege to work on such a prestigious and high profile event as the Olympic and Paralympic Games. With over 350 firing locations spread around the Olympic Stadium and Park, the scene was set for the most nerve racking 5 minutes of our lives. 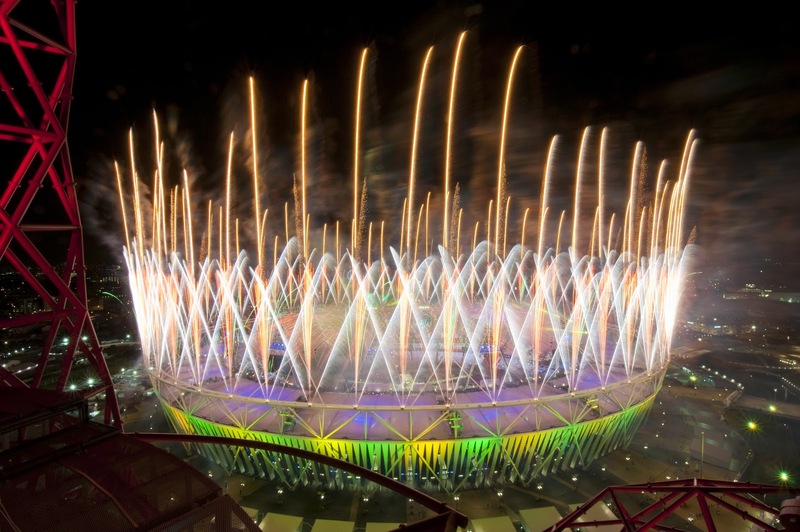 As the restrictions on what we can report lift we hope to provide a more detailed case study of the London 2012 Olympic and Paralympic Ceremonies. For the time being below is a shot taken by one of our firers, Nick Alloway. After the Olympics and Paralympic Games which ended on 9th September, we facilitated the Blackpool World Firework Championships and then moved swiftly into our busy November season where we fired 90 shows in just over 3 weeks. 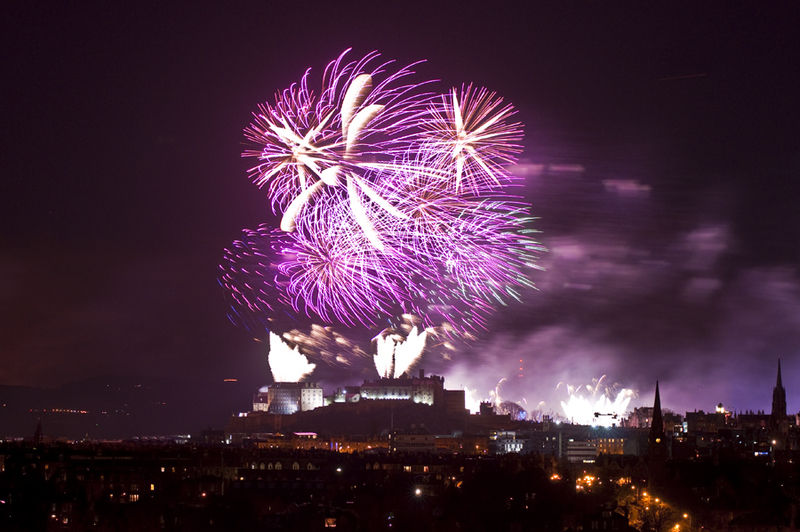 We barely had time to catch breath before we were immersed in the detail of planning, producing and delivering the two largest annual displays in the UK to mark the arrival of 2013 and to celebrate the end of an amazing 2012, with Edinburgh's Hogmanay and The Mayor of London's New Years Eve Celebrations. The words of the Mayor himself, Boris Johnson, "A brilliant start to a spectacular year", our display for London's New Year's Eve has been critically acclaimed, "The Olympic year was welcomed with a stunning display" The Telegraph, "Eleven magical minutes that dazzled the world", the Daily Mail, which also ran a full two page spread on the display with a minute by minute account of how it unfolded, unprecedented. 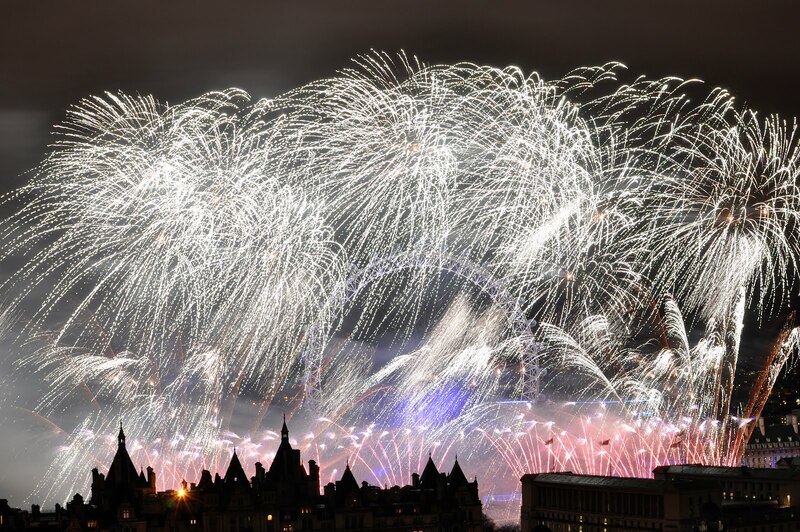 The display was watched by an audience of some 250,000 along the embankment of the Thames, as well as 12.5 million watching live on BBC 1 and up to 4.8 million hits on YouTube. 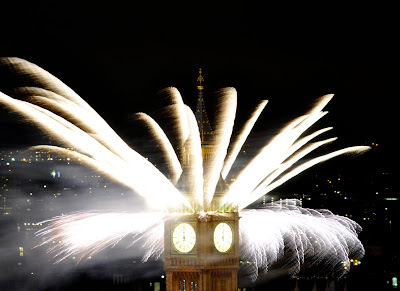 This year was even more of a challenge than last year, we wanted to exceed expectation and try and go one better than 2011, with such a restrictive footprint of the River and London Eye to work with the key was to add a new dimension, a new firing location, the obvious choice, Big Ben or the Great Clock Tower as it is officially known. We started planning in earnest for this years event in June with a request from Boris Johnson to the speaker of the house John Bercow to ask if we could use the Clock Tower in this years display. After months of negotiations, meetings, tests and exhaustive method statements and risk assessments permission was finally granted at the beginning of December, with just over two weeks to Christmas the pressure was on to design the display and to design and build the bespoke firing rigs required to achieve the desired effect, the end results we think were worth it. With the help of a fantastic sound track conceived by Creative Director of Jack Morton, David Zolkwer and Executive Producer Jim Donald and compiled by Radio 1 DJ Nihal, we wanted to mark this significant and momentous year of the Queens Diamond Jubilee and the Olympic Games with a spectacular and stunning display, using the fireworks and music to reference and celebrate these extraordinary events. 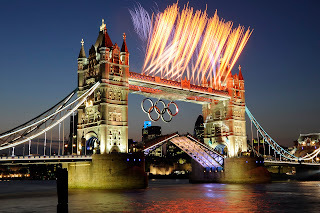 The opening with Chariots Fire and the announcement from Jacques Rogge in 2005 confirming London as the host city, we opened with a bombardment of ring shells in the five colours of the Olympic rings bursting above the London Eye which exploded with the Olympic colours from the inner rim. For the Diamond Jubilee the obvious association musically was Shirley Bassey and Diamonds are forever, we started the sequence softly with the slow tempo of the track with a bouquet of red tail comets to blinker bombettes creating 1000's of flickering stars in the sky, as the volume and tempo increased the firework choreography saw a huge barrage of our own blinker shells and white strobes literally filling the sky with diamonds. What a relief, with both displays behind us it is a huge achievement to to be able to say that we fired the two largest displays in the country on the same night, congratulations to both our teams in Edinburgh and London. Both displays have been hailed a success and London certainly seems to have lived up to expectation, heralding the start of an important year for London and the Country with the Diamond Jubilee and the 2012 London Olympics and Paralympic Games. 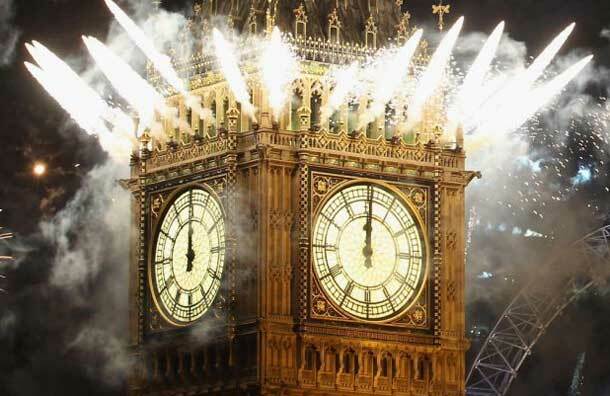 Firing from Big Ben seemed to have created the desired reaction, it was a complete surprise which we are very proud of. To be the first to bring gun powder into the Palace of Westminster since Guy Fawkes in 1605 will go down as a momentous achievement which can never be repeated, we are grateful to the staff of the Clock Tower who assisted us in making history. The media have been generous with their praise and assessment of the display, below is how the BBC decided to describe the event. 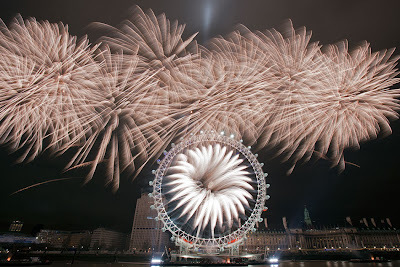 London's new year fireworks dazzled their way into 2012 in an "awesome" display that has been widely hailed by both the media and public as a stunning success. 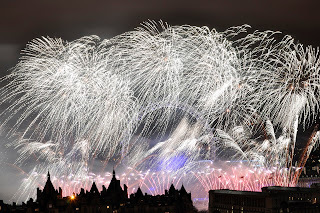 Newspapers described the capital as "the best in the world at putting on a show to celebrate the new year", while noting the "distinctly Olympian theme... with fireworks launched in the shape and colours of the Olympic rings" and there was also praise on social networking site Twitter. We have received a few images from our photographers which we would like to share, we hope that everyone who watched the display enjoyed it, we would like to take this opportunity to wish everyone a happy New Year, 2012 will be a significant year for events generally and for the Country as a whole. With a display of any kind comes the clear up, our very hard working crew managed to get a few hours sleep, finishing at 4am, before starting again at 10am to clear up the tackle and equipment before returning home to their families for a well earned rest. We would like to offer all our staff both in Edinburgh and London all the best and a very big thank you for all their hard work, commitment and professionalism. This is it, show day, with months of preparation, many production meetings, pages of paper work, risk assessments, method statements and site visits and after 4 days of intense set up with a crew of 36, the day of truth has finally arrived. 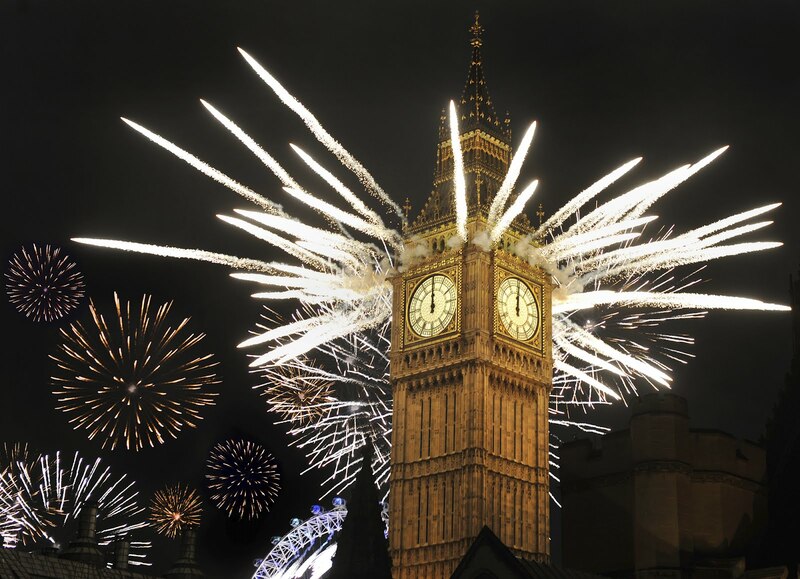 The big surprise we have up our sleeve this year which we wanted to keep a secret was the new roof top location as we referred to it, the Great Clock Tower, which houses Big Ben. With 24 firing positions and associated firing equipment a crew of eight had to haul nearly 500 kg of equipment up 334 steps of the Tower. I can not tell you how much was work required to get permission to achieve this very unique and stunning addition to the display, from a heritage and conservation point of view we new that getting consent would be the greatest hurdle to overcome, while we would be the first people to get gunpowder in to the Palace of Westminster, I did not want to be the first to be hung, drawn and quartered for damaging the structure. I did utilise this once in a lifetime opportunity to ask if I could visit the location where Guy Fawkes hid his terrible quantity of gun powder. To my surprise there is actually a plaque which reads as follows, "near this spot, beneath the old house of Lords Chambers, Guy Fawkes and his fellow conspirators hid thirty six barrels of gunpowder with the intention of blowing up King James I and the members of the House of Lords and House of Commons. The Plot was foiled on 5th November 1605 a few hours before the State Opening of Parliament". I could not resist the opportunity to get a photograph of this historic achievement we were about to embark on, 406 years later we would finally bring gun powder in to the Palace of Westminster with far less deadly intentions, but to entertain and celebrate. The remainder of the crew were working hard to bring the final preparations together. As the day progressed all of the single shot fans on the barges and pontoons were rigged and wired in. The Pontoons were dropped in to the water and tied to their temporary moorings laid for us by the Port of London Authority, while the left and right hand barge were moved in to their show position. The middle barge could not be moved in to position until the last pleasure cruiser had left the London Eye Pier. The weather looked as if it was going to be OK, not quite as as good as last year but well within the range where we were confident we could fire all the display. The winds were gusting to 15mph, although the wind was in the prevailing direction we were going to be close to the limit of the clock tower mines which would be pulled if the winds picked up any more, the comets would be fine but the mines which are lighter could in stronger winds cause us potential problems. There was also rain forecast for the early part of the evening, this did not worry us too much as everything was waterproofed and protected, including the pyro for the Eye, although this would not be rigged until later in the day. The day was a hive of activity with multiple crews spread over many locations, we had the Clock Tower Crew rigging the 24 firing positions around the balcony, the waterborne crew in our rib boat together with General Marine craning the pontoons in to the water and moving them in to show position, we had the barge crews testing and checking all the wiring and covering the data cable with sand. Finally we had the Eye crew who were getting ready to start the crucial phase of loading pyro and fireworks on to the Eye. We can not load any live material on to the Eye until it is closed to the public, at about 3.30pm the last flight or ride on the Eye commences, we wait for the thirty minute ride and watch the last of the tourists to vacate the area. As soon as the last member of the public has been escorted away the Eye and the immediate area around it is shut down and cleared of all people except for the show team. Stage Electrics start to load the moving head lights in each of the capsules while our crew move the middle barge in to its final position moored on to the London Eye Pier. A very well drilled and rehearsed team spring in to action, all of the props for the Eye inner rim are laid out in a particular order and hoisted up to the Hiab level of the Eye where they will be stowed in the correct order for rigging, the first prop to be lifted up has to be the last one hoisted up. The Eye Hub crew start their journey with the pyrotechnics up the rear support leg of the Eye to the central spindle with over 400 single shot tubes which are rigged on to the crows nest on the Hub. The lighting crew this year were very swift and completed their rig by 5pm. As soon as the last of the lights are loaded, the Eye is handed over to us, with all the props at the base of the Eye our riggers jump to action with the biggest challenge we face, loading 32 props on to the inner rim of the Eye containing over 1,000 fireworks which have to be rigged by 10pm so that the Eye can be locked down. This gives the lighting crew enough time to do their final checks before they run a full lighting show on the Eye, Shell building and County Hall as a type of warm show, a crowd pleaser, which helps the many hundreds of thousands of people who travel to central London to watch the midnight display, the chance to enjoy a bigger spectacle. It is 5.20pm on the 31st December 2011 when the London Eye is officially handed over to us, this is the moment when all our crew have to get on and deliver, we are under such a time constraint and such pressure to deliver that I can safely say it is the most agonising few hours of my life as I watch the Eye slowly rotate one position at a time as another prop gets fixed and connected to the firing network, we have just over 4 hours to rig the London Eye. Last year we were finished rigging the Eye by 21:45, this year Ian, Lee and Paul complete the task in record time, 20:30, just over three hours. The time has arrived, the London Eye is rotated to its lock down show position, our crew drop down the tails for the data runs and connect them to the home runs to the command and control where the firing panels and laptops are sitting waiting to run a our comms test, this involves a number of testing regimes which include a diagnostic check on all data networks, the control panels, each module and each individual igniter. Running this test is a very nerve racking moment, this is the first time we get to run a complete test and find out whether we have 100% or a major problem on our hands, with a little over two hours to midnight there is no time to rectify major problems. With a click of the mouse, the computer runs through the first diagnostic checks, one by one the 40 modules on the Eye show up green with a pass, we run the final continuity check of all 1,280 igniters, with a hold of the breath the results flash up, only one igniter out, which fortunately is on the Hub which is still accessible by our crew, we radio up to Tony who checks the cue and we wait for him to confirm when he is clear, we run the test again and we have 100%, a great task undertaken by our dedicated crew. 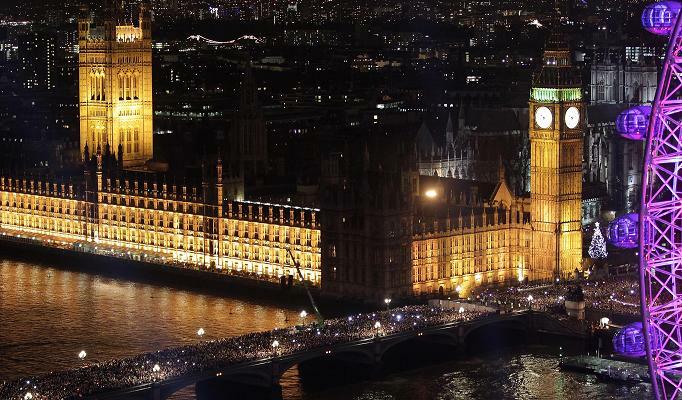 Now we are ready for the midnight moment as many hundreds of thousands of people gather in the streets around central London to witness the New Year and the start of 2012. Time is ticking fast and the moment of truth is fast approaching, today is spent rigging the roman candles on the 13 front positions on each barge. From each position we fire a wide variety of roman candles up to 47mm, single shot effects up to 60mm and mines up to 100mm. All the igniters are run into our waterproof compact rails which are built on to a mounting plate fixed in to a Peli flight case. Once the lid is closed the flight case can sit in a torrential downpour ensuring the module and the 32 dual push button connectors remain dry. The roman candle combinations are also bagged up to make sure they are waterproof, an igniter fitted and then labelled to ensure the cake is wired in to the correct cue. It takes four people the entire morning just to bag and fuse all the cakes, they are then loaded on to their respective barges and positioned in the correct orientation and wired in. With this quantity of cakes our licensed store is essential, and in the event that it is raining we have a marquee situated in the dock area so that we can work on the fireworks under cover. The final aspect to the show set up is the six pontoons which are equidistantly positioned between the barges which when added to the barge positions creates 12 firing platforms approximately 20 meters apart giving us an entire frontage of 200 meters width along the Thames in front of the Eye. From the pontoons we fire a large quantity of one shot effects, single shot fan barrages and small cakes. All the effects are carefully positioned and wired in to compact rails. By mid afternoon the barges are ready to be towed up river, one by one all three barges make the two hour trip to the permanent mooring just down river of the London Eye, where they will remain overnight until they are moved in to final show position mid morning of the 31st. The middle barge will not be moved until 4pm on the day, the middle barge is moored on the London Eye Pier which receives a large number of pleasure boats throughout the day, so we have to wait for the last tourist boat to leave before the pier is handed over to us. Tonight on the Eye we have a full technical rehearsal, at midnight we will run through the entire show, both sound and lights but obviously without any pyro. 32 moving head lights are loaded in to the Eye, one for each capsule, a team of 8 lighting technicians remove the light from its flight case, race in to the capsule, strap the light on to a support in the capsule, plug it in, connect the wireless receivers and then check to make sure the light is operating correctly before moving on the next capsule, the Eye constantly rotates as the lighting crew rig each light in about 35 minutes. Below are just a few flight cases waiting to be loaded. Once the last light is loaded, the Eye is moved to its lock down position and handed over to us. At this point we drop down the data run tails from the first cradle then connect our loom which runs from the base of the Eye to our command and control located on Queens Walk behind the Eye. This is the first time we get the chance to run a full comms test with the modules only on the Eye and Hub, a very nerve racking moment, it is here that we find out whether we have any major comms issues or not. Working on the London Eye is fraught with problems from many different aspects. The greatest problem form a technical point of view is RF and Electromagnetic interference. We are in one of the harshest environments in the country to experience both and in significant doses. The electromagnetic interference comes from the 63 amp 3 phase power cables which run around the perimeter of the Eye feeding power to each of the capsules to run the lighting, heating and air conditioning as well as the motors that operate each capsule as the Eye rotates. The RF interference comes from the very busy radio traffic which is prevalent in this part of London, both from normal transmitters in the locality as well as huge RF security nets which protect the government buildings on the opposite side of the river. If we were in any doubt of experiencing any interference, we were ensuring the best possible scenario to create interference by building a huge antenna by running two cable runs entirely round the London Eye which is the largest steel circular structure in the capital. One would not be in the least bit surprised to connect up all the data networks and find the Archers theme tune being received through our aerial. The comms test is a success with a 100% pass, while the rehearsal takes place we run the laptop to constantly test sequentially each module in turn, in the three hours the Eye is locked down we send over 4,000 packets of information and not one drop out from any module. Events and commitments leading up to the display some what over took my ability to continue the blog, so I will finish it with a retrospective look back at the set up and the hours leading up to the midnight moment. The last of the three barges has received its quota of shells and has been wired in, all the racks are now loaded and connected to the FireOne Rails, each barge contains 48 modules each capable of firing 32 cues, this allows us to fire each shell, roman candle and single shot tube individually allowing for maximum synchronisation and control over what is fired and when. In order to protect the shells and their fuses from getting wet, we cover over the tubes with thin sheets of plastic. The team at the docks consisted of three barge crews, eight on each, in addition we had a production manager who was responsible for getting any additional equipment that was required like nails, screws and tools, they were also responsible for ensuring everyone had the correct PPE and liaising with the marine company who owned and moved the barges. In addition we had two banks men on the dock side who were responsible for loading the equipment and fireworks on to the barges. Each lunch time a team of caterers arrived to feed the crew a hot meal and provide drinks for the hard working pyrotechnicians, this ensured that everyone was well fed but also meant time was not lost in people disappearing for long lengths of time to get their own food. The London Eye team had the unenviable task of running four outputs around the inner rim of the Eye connecting up to each of the 32 inner firing positions. The wiring plan was carefully thought through to ensure that in the event of an output being lost we would not loose an entire section of the Eye, by wiring in every other position on each output we were building in a degree of redundancy and still maintaining a complete rotation of effects around the Eye. The London Eye team consisted of a team of ten crew, four worked on the Hub or central spindle while five worked on the inner rim of the Eye, the tenth person was acting as our central Production Manager, making sure the crew were ready and properly harnessed to work at height, they were also responsible for completing the paper work with the London Eye technical team and getting the permits to work each night, their final role was to sit in the operating booth at the base of Eye and ask the operator to move the Eye to required orientation so that our crew could work on the relevant part of the inner rim. Another good day with the crew in high spirits, progress has been excellent as has been the weather, all be it a little cold on the water with the moderate winds we have experienced today. All of the shells for two of the three barges have been loaded and wired in. Some of the statistics of quantity of effects includes nearly 2,400 x 75mm shells, 2,800 x 100mm shells, 1,200 x 125mm shells and 60 x 150mm shells. The emphasis is more on lower level shells because the display is broadcast live on BBC 1 and last year watched by over 11 million people, the display is primarily designed for the 16 : 9 wide screen aspect ratio. 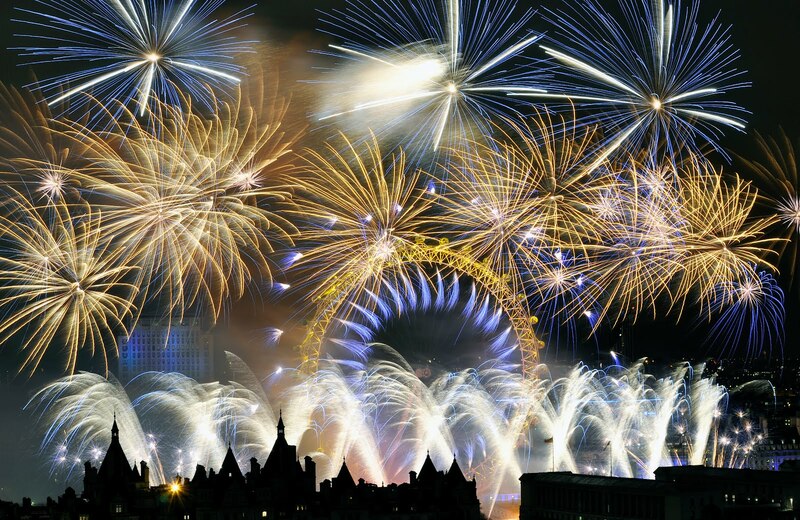 With a large quantity of fireworks one challenge that we have to overcome is the temporary storage of fireworks, we licence an explosive store with the local authority under MSER, this enables us to rig the display far more safely with a limited quantity of fireworks on the barges at any one time. With a display of this size, the storage limit we can licence is well short of the total net explosive content in the display, in order to overcome this we have a type II explosive vehicle which ferries limited quantities from the factory in Cambridgeshire each day, today we had two trips, one arriving first thing in the morning with one barge and the second arrived just after lunch with the second barge, in all six trips will be required to ferry all the fireworks to the site. We use a large number of roman candles and single shot effects to provide continuity and to emphasise the synchronisation with the soundtrack, in all we will fire in excess of 4,400 x 30mm effects, 2,800 x 45mm roman candles and shot tubes and 800 x 60mm fireworks. With this quantity of fireworks fired from so many locations synchronised to a sound track and all fired at midnight we require a very robust and reliable firing system. FireOne has proven itself to be the market leader for these types of large scale events and we have invested heavily in this system. With a total of 12 XL4 control panels and 5 XLII panels, over 250 firing modules, a considerable quantity of equipment is required. All of the control panels including the back up controls have to be fully charged and have the correct fire file downloaded in to the panel. Once again the London Eye team had another productive night rigging the final cradles, with plunging temperatures and fresh winds picking up, our crew had to rotate every hour so as to avoid excessive exposure to the elements. With all of the cradles now rigged, next job is to network the modules and run the data cable, approximately 2 kilometers of data cable alone for the Eye and Hub have to be attached in looms around the inner rim and leg of the Hub.